It's my so called scarf! I don't remember the yarn...the tag is not where I am right now. But I will get back to you on that. I believe it's Manos del Uruguay. 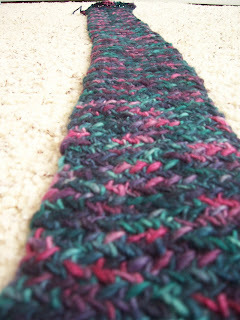 It was such a fun and fast knit ^.^ I absolutely looooove the colors. 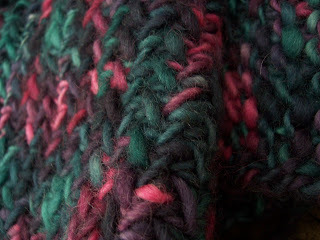 I only used one skein, which was __ yards. Grr me and leaving the details. Oh well. I used size 10.5 bamboo circulars. 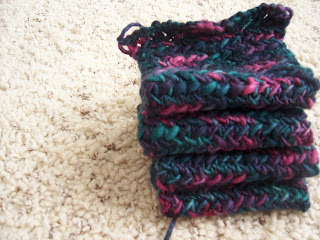 I started with size 8 circs…which was not a very good idea. 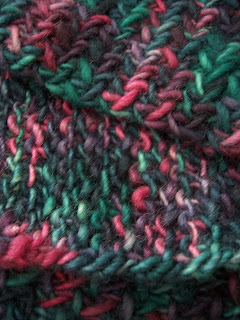 But I bought the yarn (amongst other yarns) and the needles when I was on vacation so it was all I had. I like the 10.5s since it makes a much softer fabric but not too loose. 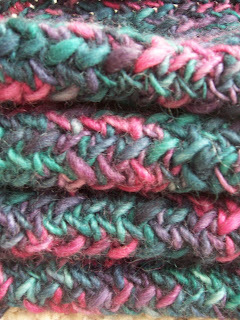 And when I changed to 10.5s, I only cast on 26 stitches because I didn’t want my scarf to be that wide. I love the pattern, though. So pretty!